This Starlight Macaw must surely know how attractive it is, raising its wings to show off its beautiful colors! 2nd - Miligold Macaw crossed with a Scarlet Macaw = Harligold Macaw. One of the Starlight's parents, the Miligold Macaw (which is a cross of the Military Macaw and Blue and Gold Macaw) is a hybrid macaw that is a good natured beauty. The MIligold's Blue and Gold parent is a very popular macaw, known for its sweet nature and talking ability. Its other parent, the Military Macaw is also a favorite pet because of its good temperament, intelligence and trainability. The wonderful attributes of the Miligold make it a great parent for the Starlight Macaw. Crossing the gorgeous Miligold Macaw with the fiery Scarlet Macaw brings a strong vibrant red coloration into the mix. Because of its beauty, the Scarlet Macaw is one of the most highly favored macaws. This sweet though independent tempered bird has been the best known South American parrot for over 100 years. The Starlight Macaw inherits all beautiful coloring of its parentage, as well as a composite of their personalities. The behavior and temperament of hybrid macaws are more unpredictable and uncertain than the coloration. Starlight Macaws are a hybrid parrot that is very colorful with the intelligence and temperament of its parents. The Starlight should be quite trainable, learning to talk and do tricks. This macaw can be a very affectionate, inquisitive, and fun companion, but may also have inherited a strong personality. As with all macaws, the Starlight Macaw will require good socialization and a firm consistent hand in training, especially as it matures. The Starlight Macaw is a second generation hybrid macaw. 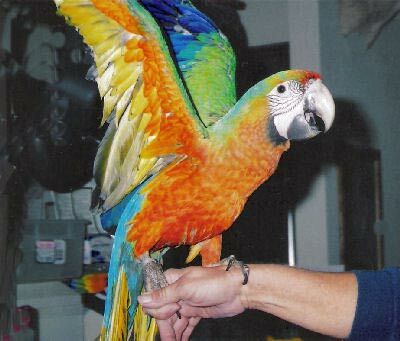 It is a cross between a Miligold Macaw hybrid and a Scarlet Macaw Ara macao . Starlight Macaws are a very brightly colored macaw hybrid. Both parents contribute to the colors of their offspring, though the father's have the dominant gene and this will influence their final appearance. The Starlight Macaws (pictured above and to the right) have a Scarlet Macaw father and a Miligold mother, so are strongly influenced by the colors of the Scarlet. One of the Starlight's parents, the Miligold Macaw, brings strong greens and blues into the mix, an influence of both its Blue and Gold and Military Macaw parents. The bright reds on the forehead are also from the the Military, but can be strengthened even more by the addition of the other parent, the Scarlet Macaw. The Scarlet Macaw brings out a lot of bold reds, especially to the underparts. You can also see its influence in the coloration of the beak, being a whitish color rather than the black seen in the parent's of the Miligold. The Starlight Macaw gets a beautiful combination of colors from its parentage, making it one of the most impressive hybrid macaws. Starlight Macaws 's are a full size macaw. It is is highly intelligent and trainable. It can learn to talk with a general vocabulary of about 15 or more words and expressions. The Starlight Macaw typically takes on a composite of traits from its parentage, having a sweet friendly nature, as well as being highly intelligent and curious. They can be a very good natured and intelligent pet bird that is trainable and can learn to talk. They are a typical macaw. Can be cranky at times and may even be a one person bird or only like men or women unless well socialized. To have a well rounded bird that enjoys more that one person, make sure it is well socialized with lots of folks. He sounds like he's a great bird in general, but is resopnding to certain triggers by biting you. The biting seems to occur as the result of fear or being unable to respond to stimuli in a better way, so here's a couple suggestions to try. Avoid things that trigger biting as much as possible. When he does bite, push your hand towards him and then put him in his cage and leave the room. Don't show any other response. When he's not biting, be very affectionate to set the perferred tone of the relationship. You can also try the BirdTricks training videos for this macaw, Training A Military Macaw, we've heard great reports about their bird training over the years. I own 7 Macaws and find that the hybrid-hybrids are the friendliest. My Rubalina and Starlight show more affection than any of the rest. I own a Green-Wing, Scarlet, Blue&Gold, and 2 Calicos. I love them all, and their different personalities. Each bird is special, but the Rubalina and Starlight are much more friendly and playful with me. Having been owned by a Harlequin macaww, I must say they are beautiful! The behavior is typical macaww, you must try and change it young as when they get older it becomes a problem since they really never leave the "toddler" stage. Enjoy a long and healthy life. BTW mine would pinch bite and when you said oww she laugh at you! I stopped mine from pinch biting. Scarlets actually. I would put my thumb in their beak when they went to pinch bite and do a figure 8 with their head. Took about a week but instead of pinch biting they would twist their head into a figure eight and go back and forth. It worked and it was humorous. Just a thought.